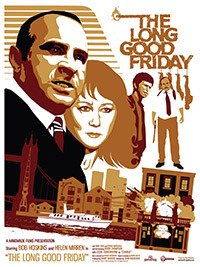 The Long Good Friday is a classic British Gangster film released in 1980 and starring Bob Hoskins in his breakout role and Helen Mirren. Hoskins plays Harold, a prosperous English gangster, is about to close a lucrative new deal when bombs start showing up in very inconvenient places. A mysterious syndicate is trying to muscle in on his action, and Harold wants to know who they are. He finds out soon enough, and bloody mayhem ensues.